We've covered Edge of Space a bit over the past couple of years, most recently in the form of an Early Access preview from May in which Ian concluded that while he couldn't quite recommend the game at that time, there were "a lot of great ideas here (and a lot of great writing)," and he remained hopeful that it would ultimately come together in the final release. We'll find out if his optimism will be rewarded on September 17, when the game finally leaves Early Access. Developer Handyman Studios announced the official launch date today, and even though it's been more than two years since it first appeared, it also promised that development will continue. "This is a major milestone goal for us, but the journey doesn’t end here," studio founder Jacob Crane said. "As we’ve demonstrated in our Early Access development, we will continue to deliver consistent content updates to include new missions, weapons, monsters, events, and much more." 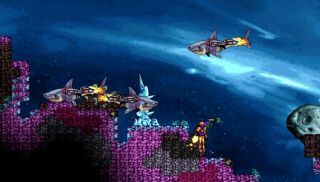 Edge of Space is an "open-world, dynamically-generated, sandbox survival-adventure game," in which players must explore and survive in a strange and dangerous world, equipped only with a "laser mining pick" and the bits of gear they were able to salvage from their crashed cryopod. It's still available as an Early Access release on Steam, and more information is available at playedgeofspace.com.